CommsCentre can assist with the installation of a TV antenna to your home or business, allowing you to pick up digital TV. 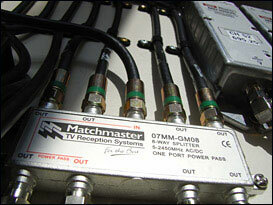 MATV stands for Master Antenna Television. It is the means by which many apartment houses, hotels, schools and other multi-unit buildings distribute TV and FM signals to a number of receivers. Contact CCBT today to find out more about our TV antenna installation services.